Brush off the chilly January blues and focus on the warm fuzzy feelings that come with Valentine’s Day and supporting a great local cause. A Loving Spoonful Candy Grams are back this year and are available for purchase now, ensuring your special-someone gets a funny, sweet, or flirty delivery on this cheerful day. A Loving Spoonful CandyGramsinclude a special-edition Valentine’s Day card, a message of your choice, two delicious Purdy’s heart-shaped chocolates, a complimentary McDonald’s Signature McWrap, fresh mints in a stylish tin from Yelp, and a Shamin Jewellers sparkly heart cell phone charm. Sponsors donate all the items included in the CandyGrams so proceeds from the sale of CandyGrams will go directly to assisting those with HIV/AIDS. Each year, A Loving Spoonful’s volunteers deliver over 100,000 meals to those in need, and with very little government funding they rely on the generosity of the community. Although A Loving Spoonful is based in Vancouver, their CandyGrams can be sent anywhere in Canada — and they only cost $10! For on-time delivery (via Canada Post) by or before Valentine’s Day, orders must be placed before February 4th for Eastern Canada, before February 6th for Western Canada, and before February 10th for Metro Vancouver. 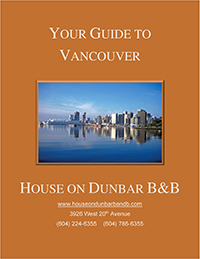 "House on Dunbar B&B is nicely decorated, has a beautiful kitchen and great places, inside and outside, to relax and read. We had a very comfortable bed and found our room a nice retreat with all we needed in it. Joanne made us beautifully fresh and delicious fruit smoothies, and a variety of very creative and ultimately tasty breakfast dishes. It has been a wonderful stay and, with the price in mind, I think one cannot do much better in Vancouver."